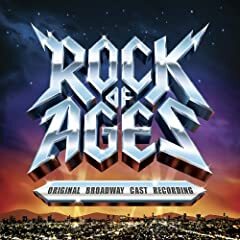 The Rock of Ages cast album hits stores today and is half-priced on amazon.com for a limited time! The recording features 2009 Tony nominee Constantine Maroulis (The Wedding Singer), Amy Spanger (The Wedding Singer, Kiss Me Kate), James Carpinello (Saturday Night Fever), Adam Dannheisser, Mitchell Jarvis (Fiddler on the Roof), Michele Mais, Lauren Molina (Sweeney Todd), Paul Schoeffler (Sweet Charity, Nine), Wesley Taylor, Ericka Hunter (Flower Drum Song, 42nd Street), Jeremy Jordan, Michael Minarik (Les Miserables), Angel Reed, Bahiyah Sayyed-Gaines (Pal Joey, The Color Purple), Katherine Tokarz (White Christmas, A Chorus Line), Andre Ward (Xanadu, The Producers), Savannah Wise (Les Miserables), Tad Wilson (The Full Monty) and Jeremy Woodard (Glory Days). Order the CD from amazon.com now!